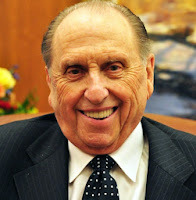 President Thomas S. Monson (b. 1927) was sustained to the Quorum of Twelve Apostles in 1963. He served as a counselor in the First Presidency with Presidents Benson, Hunter, and Hinckley until becoming Church president in 2008. "The Master frequently spoke of hand and heart. In a revelation given through the Prophet Joseph Smith at Hiram, Ohio, in March 1832, he counseled: '...be faithful; stand in the office which I have appointed unto you; succor the weak, lift up the hands which hang down, and strengthen the feeble knees. "As I ponder his words, I can almost hear the shuffle of sandaled feet, the murmurs of astonishment from listeners as they echo from Capernaum's peaceful scene. Here multitudes crowded around Jesus, bringing the sick to be healed. A palsied man picked up his bed and walked, and a Roman centurion's faith restored his servant's health. 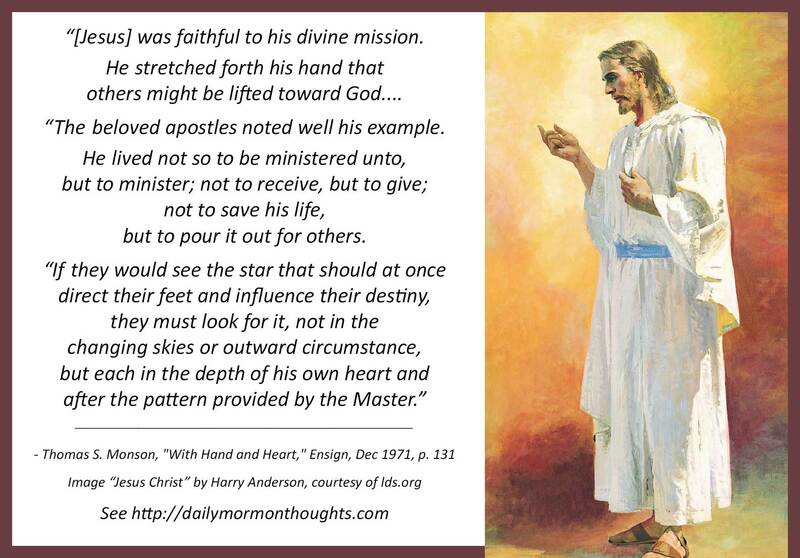 "The beloved apostles noted well his example. He lived not so to be ministered unto, but to minister; not to receive, but to give; not to save his life, but to pour it out for others. 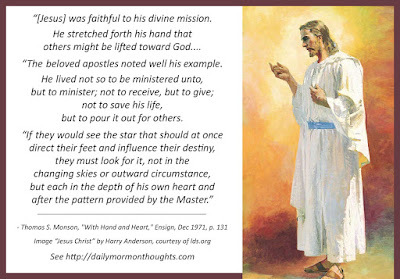 "If they would see the star that should at once direct their feet and influence their destiny, they must look for it, not in the changing skies or outward circumstance, but each in the depth of his own heart and after the pattern provided by the Master." President Monson is wonderfully sensitive to the message of the Savior's life. Joy and blessings come as we serve one another; the Savior not only taught, but demonstrated that truth. The call to each of us is to follow Him in that eternal work. Each of us can find the true desire to be like Him "in the depth of his own heart" and thus mold our life as He showed the way.